DT11: the Champion’s Choice for Professional Competition The DT11 currently boasts the best technology applied to shotguns for clay target shooting. Heir to the famous DT10 – the Beretta over and under that achieved the greatest international success – it is designed not only to meet the technical requirements of the shooting discipline, but incorporates the features of the most prestigious models. DT11 EELL elevates this prestige to the highest level adding long sideplates.and bringing the wood grade from 3 to 4. 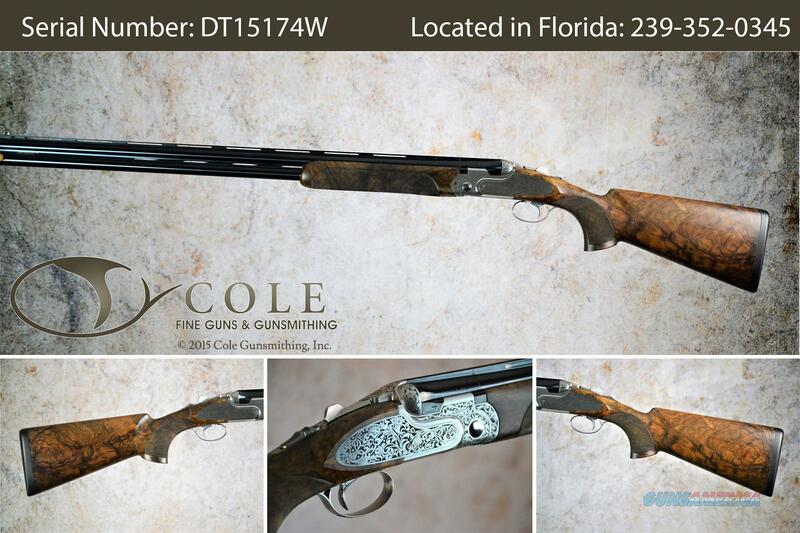 The DT11 is Beretta’s top-of-the-line competition shotgun, used by the world’s absolute best clay shooters. It is built around a vault-tough cross-bolt action, a whole 3mm wider than its predecessor’s (the DT10) and therefore stronger and even more durable. The trigger has a truly custom feel, breaking at a crisp 3 ½ lbs--which minimizes muscular interference with your swing and results in many more broken targets. The center-mass of the DT11 is designed to be low and coaxial with the bottom barrel, giving this shotgun unmatched stability and greatly reducing muzzle rise. And with its premium-grade Steelium-Pro barrels and high-grade stock that can be tailored to the customer’s specifications, the DT11 was born and bred to keep the serious competitor on target and on the podium. Wide Receiver for Durability, Stability Before rolling out the DT11, Beretta has consulted and worked with the world’s top professional clay shooters, to create a shotgun that will stay miles ahead of the second-best. The best-in-class DT10 action has therefore morphed into the even-better DT11 receiver. The overall 3mm increase in the width of the receiver went all to enhance wall thickness, so that the gun will not only be even more durable, but also offer dreamlike stability and balance to the competitive shooter. Improved Grip and Operation Thanks to its unequaled experience, Beretta knows that at the professional level every detail can make the difference between gold and silver. We have accordingly incorporated several tweaks to the design of the DT11 for a no-compromise quest for victory. The redesigned top lever improves the grip, reduces stress and provides more comfort for both right- and left-handed shooters. Also, the shape of the safety selector has been redesigned for a better grip and smoother operation, to keep the mind of the competitor where it matters without any fatigue or distraction. Premium Barrels The DT11’s Steelium Pro barrels are constructed of a proprietary steel engineered to offer extreme durability and superior ballistic performance. The long, 480mm forcing cone keeps shot patterns consistently accurate while minimizing recoil and muzzle rise. Also, the newly designed barrel bridges are internally hollowed, while the side ribs are windowed to improve barrel balance and help dissipate heat. No wonder that Beretta’s DT11 is considered today’s absolute best competition over-under shotgun.